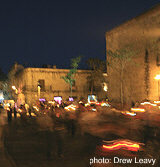 Y ou'll hear Pidiendo Posada, the traditional Mexican Posada Song, everywhere you go at Christmas time in San Miguel de Allende. It wafts from shop doors and open home windows, echos from school rooms where kids are practicing for the real processions in the streets. It is one of the main symbols of christmas in Mexico, as beloved, ubiquitous and instantly recognizable as "Silent Night" is North of the Border. As the candlelit procession with Joseph leading Mary on her donkey winds through the streets, the Pilgrims knock on the doors of various houses. They sing the first stanza of the song, and the people behind the closed door reply with the second and so on, back and forth. The pilgrims are turned away several times before they reach the night's chosen house. Here, the householders realize who is really knocking. The final choruses are sung, the door swings wide, and the pilgrims are allowed inside. There are prayers, piñatas for the children and hot ponche, the traditional Mexican Christmas punch, for everyone. There are regional variations in the lyrics to the Posada Song, but here you'll find one of the most common. In case you are not familiar with the traditional tune of the song, here is a music sound file of the Posada Song so you can hear what it sounds like. With a little practice, you'll be able to join one of the posadas as they criss-cross san Miguel de Allende, and join in singing Pidiendo Posada: the Posada Song. que nos hemos de abrir. we're not going to open. dear man of the house. for the Queen of Heaven.